Does your home or business need a new and revitalizing look? If so, our pine soffit and premium white wood trims may be the perfect investment for you. Pine & Premium White Wood siding makes a versatile and elegant addition to nearly any building. With many options involving styles, colors, and finishing, there’s sure to be an option that meets or even exceeds your expectations. At Wine Valley Siding, we’re dedicated to providing our valued customers with a wide number of these siding options to help add a whole new look to various homes and businesses. 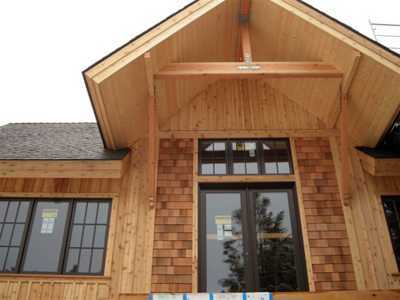 From our western red cedar to our fiber cement and white wood soffit & trim, you’re sure to find an option that suits your personal and unique tastes. Here at Wine Valley Siding we’re happy to provide assistance during every step of the way. We can help you select the perfect siding for your needs and have it promptly shipped to any location within Western Washington as well as several counties in Eastern Washington. Real wood siding, soffit & trim simply adds a luxurious and high-end look to a home or building, boosting its aesthetic appeal and overall value. Though wood siding & trim does require regular maintenance, there’s no other option that compares when it comes to authenticity and elegance. Wine Valley Siding takes pride in educating our customers about the options that best fit their needs and helping to make their home improvement dreams come true. So what are you waiting for? Our team here at Wine Valley Siding will do all it takes to keep our customers satisfied. Stop by our lumberyard to browse our wide selection of authentic wood siding. We guarantee that our exemplary customer service and expert knowledge will have you leaving with a smile and a better idea of your project needs. You have nothing to lose — call us or visit us today!